Want to get back to basics? If you're the kind of person who likes to do things the old-school way, you’ll love this coffee roaster. Roast anywhere from 1/4 lb. to 1.5 lb. of beans over your stovetop! Keep in mind, this method will produce a bit of smoke and you will need a colander to cool your beans after. Includes a 1" dial/5" stem 50-550F thermometer (MT505). 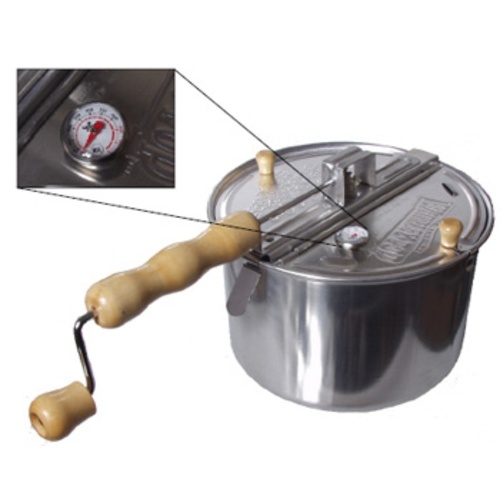 Each Whirley-Pop unit is drilled so that this thermometer fits right in the lid and the base sets just above the roasting beans - ensuring an accurate temperature reading. Radius of Whirley Pop is 4"
I wanted to dip my toe in the coffee roasting ocean. I started with this roaster and used it for about 9 months before moving on to a more automated roaster only after I understood the various aspects and relationship of the physical changes/characteristics the beans. The key is to develop a detailed understanding of the relationship of how the smell progresses from straw getting more pungent as the beans begin darken towards the 1st/2nd cracks. Before getting a more automated roaster you truly need to recognize the progression of the roast from the changes in smell as related to the cracks. Additionally, the most important visual cue relates to the absence or present, and increase, of oil on the beans - not darkness of the beans. I originally went to the Nesco on here after the Whirley mostly because the plastic gears broke twice after some significant use. The Nesco is nice because you still have the ability to easily track changes in smell because of the exhaust while, somewhat problematic because of the noise of the motor and spinning beans, you can still track the 1st/2nd cracks. I really liked this roaster better than $350+ drum roasters despite only able to do about 1/3 of a pound vs 1+ pounds of the drum types. If you consider all things, a 1/3 of a pound is perfect for ensuring that you always have the freshest coffee available. If you drink regularly, that 1/3 pound will be gone before 7-10 days when quality begins to decline. Those are just my $0.03 worth. You can't get a better value than the whirly pop. It is labor intensive and loud as sin but gets the job done and base model is available at many local stores for under $20. Grinding aluminum into your coffee! dont buy! So I wanted to get into making coffee. I bought the most economical roaster available. The whirley pop is made of aluminum, after an hours worth of spinning or so (5-7 pounds of coffee) a ton of aluminum is obviously being removed as if you are mining for it DO NOT BUY THIS MACHINE. aluminum causes Alzheimer's dominant drink anything made from these. Whirley Pop does make a stainless steel version. Do a search for that if aluminum bothers you. I have been using whirly-pop method since 2003. I have melted one of the thin aluminum pots in 2005 when I let it get way, way too hot on the grill but I have been using my 2nd aluminum one for 10 years with no issue. I do not scrape aluminum off the pot, or i would have worn through by now. I have to add a bit of oil, I usually do 1/4 tsp or so light olive or coconut oil with a quarter pound of beans, add a couple flicks of water if they're too dry to crack in 15-20 minutes. They start to smell like they're burning before they've quite hit a medium roast. My aluminum pot has a nice seasoned coating of coffee oil on the inside, usually takes 20-25 minutes on my electric stovetop. Labor intensive and loud, but cheap solution that works quite well. Pour beans between my SS pasta strainer and SS mesh brewing strainer to cool and let the chaff blow away. Also freshens up store-bought beans quite nicely in 5-10 mintues.